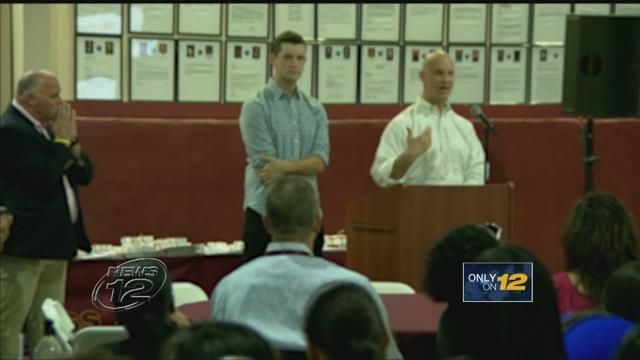 YONKERS - The Blind Brook basketball player who collapsed on the court last December is marking National EMS Week by thanking the people who saved his life. Jordan Schoen went into cardiac arrest in the middle of a high school basketball game. It was Dec. 27, and the 17-year-old was playing in a tournament at Pelham Memorial High School. "The last thing I remember that day was getting off the bus," he said. His mother, Alice Schoen, said she thought he was dehydrated. "I didn't understand it," she said. Empress paramedic Alanna Badgley, part of a four-person team that raced Schoen to the hospital, said police officers and helpful bystanders deserved credit for the save. Schoen and his family presented an award Thursday evening to Badgley and her colleagues. "This is the first time I ever got to shake someone's hand that I had a part in helping," said Eddie Fox, another paramedic working for Empress that day. "Everybody was helping each other, and I was just very lucky that everyone was there helping me," Schoen said. "That's why I'm here today."